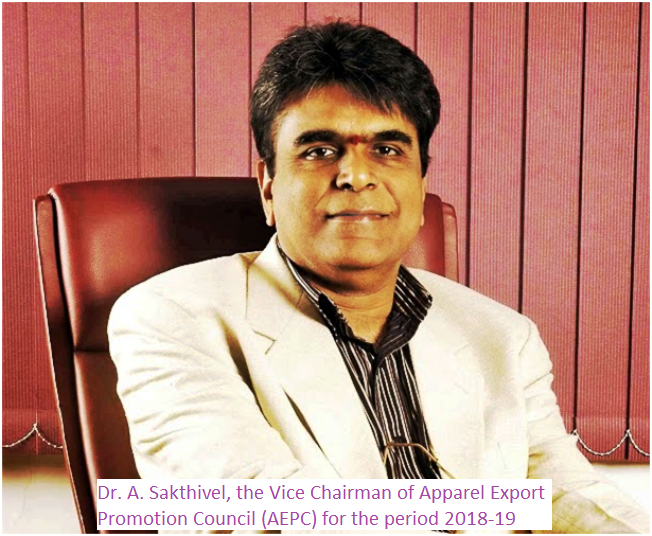 Dr. A. Sakthivel has been unanimously elected as the Vice Chairman of Apparel Export Promotion Council (AEPC) for the period 2018-19. Dr. A. Sakthivel has previously been the Chairman of AEPC for three tenures in the year 1998, 2004 & 2012 and has also been a member of Executive Committee of AEPC for the last 35 years. During his earlier tenures, he had steered projects like the Knitwear Technology Mission, the Sector Skill Council for Apparel, a national Social Compliance Project for apparel sector and several other initiatives for holistic development of the sector. In his eminent career of more than four decades, Dr. Sakthivel has held various positions including that of the Chairman of Indo American Chamber of Commerce (IACC). He is the Founder President of Tirupur Exporters� Association (TEA) and has served the TEA for 25 years. For his role in placing Tirupur on the World Map as the main cluster for sourcing knitwear supplies from India and his contribution to Apparel Industry, the Government of India bestowed him with PadmaShri in the year 2009 .A guide and mentor to Tirupur knitwear Industry, DrSakthivel has steered the growth of exports from Tirupur from a mere Rs.15 Crores in 1984-85 to more than Rs. 27,000 Crores in the year 2016-17. He is also the Chairman of Poppys Knitwear, Tirupur which exports to over 50 countries worldwide and is a trusted supplier to global brands like Marks & Spencer�s, Next and Tesco, Waitrose, Mothercare, Debenhams, John Lewis, etc.